Released after the varied (but commercially successful) soundtrack More, Ummagumma was meant to be a tour de force for the Floyd. The two-record set was half live and half studio and the first release on EMI’s new Harvest sub-label. The first record was culled from a series of concerts earlier in the summer, offering the first live document of the Floyd. Here, "Careful With That Axe Eugene", the archetype of their slow-building space rock, made its first appearance. Also included were the previous year's "Set the Controls" and "Saucerful of Secrets", along with the Barrett written "Astronomy Domine". Only "Interstellar Overdrive" was absent. But whether the excitement of the live Floyd experience came across on record is up to debate. Their compositions were certainly linear and relied on texture more than any Prog invention. The Floyd would prove highly influential to an entire generation of Germans, in the ubiquitous form of Krautrock. The second record showcased the four members of the band by featuring a solo track from each. Unfortunately, they all equally come across as un-sensational experimentation, even Water's cleverly titled "Several Species of Small Furry Animas Gathered Together In A Cave And Grooving With A Pict". Perhaps the sum is indeed greater than the parts. But that concept - the individual showcase - would rear its head again and again in Progressive circles. The album was the Floyd’s most successful to date, reaching No. 5 in the UK, and also gave them their first chart action in the US, at No. 74. Pink Floyd basically had three different stages: (l) It's genesis, with the twisted genius of Syd Barrett at the helm, (2) The late sixties/early seventies version with the quintessential lineup of Waters, Mason, Wright and Gilmour, and (3) the post-Waters version. While fans of Floyd tend to bicker over which stage was best, I believe that Ummagumma stands out as their best work in retrospect. I know Dark Side of the Moon is their most lauded work, but that is when they got too commercial. 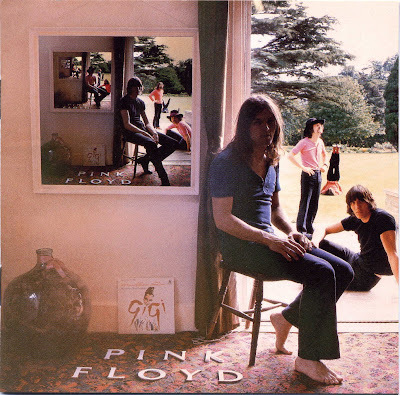 Ummagumma came out as a double album, one record featuring them live in concert and the other showcasing the solo talents of each of the four band members. The live album is the standout, and if you ever saw them do these tracks in concert at this stage of their career, then you caught one of the more memorable moments in rock music. "Astronomy Domine", a Barrett tune, is simply awesome. When I saw them do this in concert, Wright utilised a joystick that was able to rotate the sound 360 degrees around the arena, which was surrounded by speakers. Equally stunning is their closing opus, "Saucerful of Secrets". Strap in for warp speed. The studio album is unique too, with the contributions by David Gilmour and Richard Wright probably being the best. Roger Wright's cut of "Several Species of Small Furry Animals . . ." has to be one of the strangest cuts ever put on wax, and is best heard while listened to in total darkness. This album came out when Floyd had a cult status, and before the commercial success of Dark Side of the Moon evolved them into something else, which for my taste, lacked the power and imagination as demonstrated on Ummagumma.